Customers with an NFC phone can now sign up at any GE Money Bank branch to begin making mobile payments. 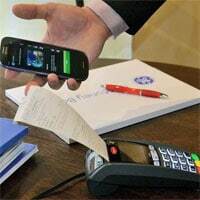 Telefónica Czech Republic has announced the full commercial launch of its NFC mobile payments service. The rollout is taking place in conjunction with MasterCard and GE Money Bank, which plans to offer customers the option of using mobile contactless stickers as well as NFC phone-based payments. Customers who sign up for the service at their GE Money Bank branch will be able to make purchases with their NFC phone at any merchant equipped to handle MasterCard PayPass contactless transactions. Purchases of up to CZK 500 (US$26.40) can be made without entering a PIN and larger purchases can be made with a PIN. Three models of Samsung Galaxy NFC phone are currently available to Telefónica Czech Republic customers: the Galaxy Note II, Galaxy S III and Galaxy Ace 2. A dedicated website has also been unveiled by Telefónica at www.kartavmobilu.cz, with the aim of educating Czech consumers about NFC technology, applications and available services.